This candidate for my Best Title Ever award dates from about 1800. It’s played here in a set with Wedding Shoes. Boldwood’s core repertoire stems from forgotten tunes played back into life from obscure manuscripts dating largely from 18th century England – a wondrous musical era when, their website says, “the worlds of folk and classical music happily co-existed and inspired each other to produce rich and fascinating instrumental music”. 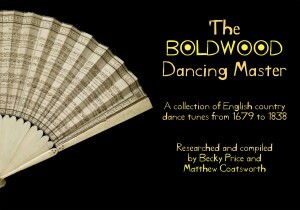 The dots for Jackson’s Shaving Brush can be found in The Boldwood Dancing Master – a musical treasure-trove of over 70 tunes available from the website. The cover photo alone taught me things I didn’t know about all those Austen balls: next time I’m in Oxford, in the Ashmolean, I’ll tear myself away from my old friends the Stradivarius guitar and Powhatan’s Mantle and the mediaeval bishops’ rings, and make the acquaintance of Dance Fan for the Year 1789!